My Fall campaign to get the rest of my home-grown beets on the menu has met with moderate success; beets now regularly colour gravies, sweeten braises and, grated, make their way into a number of dishes I won’t name here because L will stop eating them. There are still plenty in the garden so last weekend I upped the ante a bit and used them openly, although sparingly, in a simplified version of this recipe adapted from Maze, the cookbook by Jason Atherton , chef at the Gordon Ramsay restaurant, Maze. There’s something exciting about vegetables picked fresh from the garden in dark December long after the farmers markets have closed. Now that we have more snow on the ground than I normally like to see in an entire winter, harvesting is going to seem even more miraculous. The beets in this dish, quickly pickled in a flavourful marinade, have crunchy prominence but don’t overwhelm the goat cheese and pine nuts. The recipe called for a beet reduction to be added to the dressing, but I opted for a plain vinaigrette: there’s only so far I can push my luck. Or L, for that matter. Using a mandolin (or an extremely brave sous chef with a sharp, sharp knife), slice the beet very thinly. Once sliced, stack the beet slices (a few at a time) and use a small round cookie cutter to cut them into discs. Save the leftover bits. Whisk the marinade ingredients and pour over the beet discs, making sure they don’t stick together. Cover and chill overnight or marinate at room temperature for 2-4 hours. Cut the leftover beet bits into little sticks and sauté for a few minutes in butter and a little thyme. Drain and set aside. Season the goat cheese with salt and pepper and beat until smooth (add a little milk to soften if it’s heavy cheese). Spoon into a piping-bag fitted with a small tip or, like me, a small plastic bag with one corner nipped off. Mix the dressing of red wine vinegar and olive oil. Season to taste. Toast and chop the pine nuts, add some to the dressing and scatter the rest around the plate. Place a disc of the marinated beet on the middle of each small plate. As neatly as possible, pipe a tall mound of goat’s cheese on to each disc (not too neatly in my case) and put a small amount of the sautéed beet sticks on top. 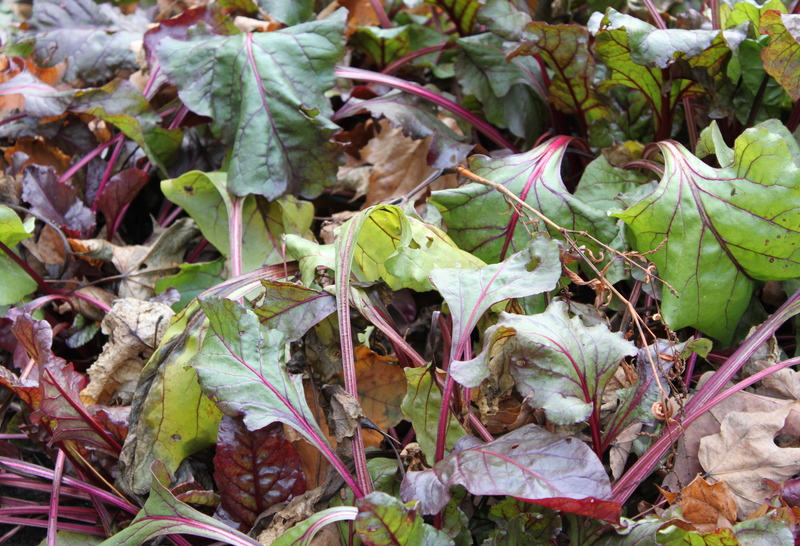 Place another slice of beet on top, garnish with just a few baby greens and drizzle with a little dressing. 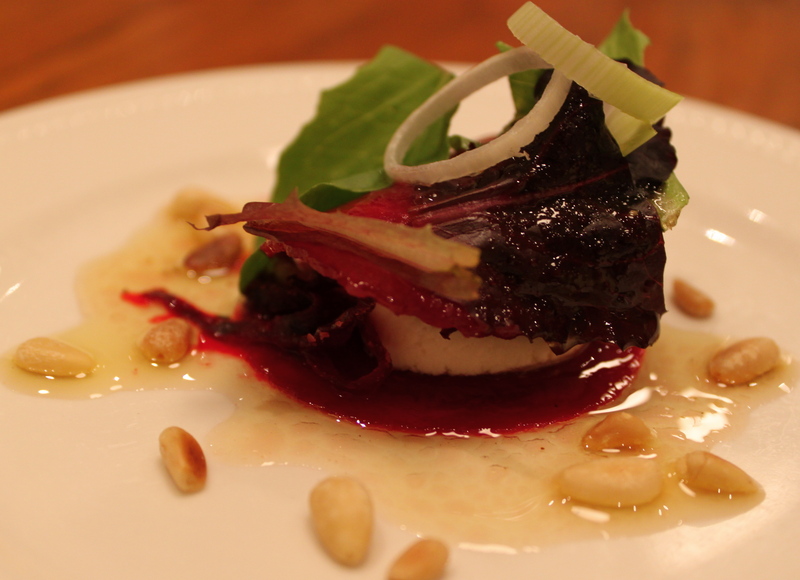 This entry was posted in Appetizers, Vegetables and tagged beets, cooking, food, goat cheese, marinade, pine nuts, recipe. Bookmark the permalink.